Dolores Hidalgo is a source of beautiful Mexican bathroom sinks. 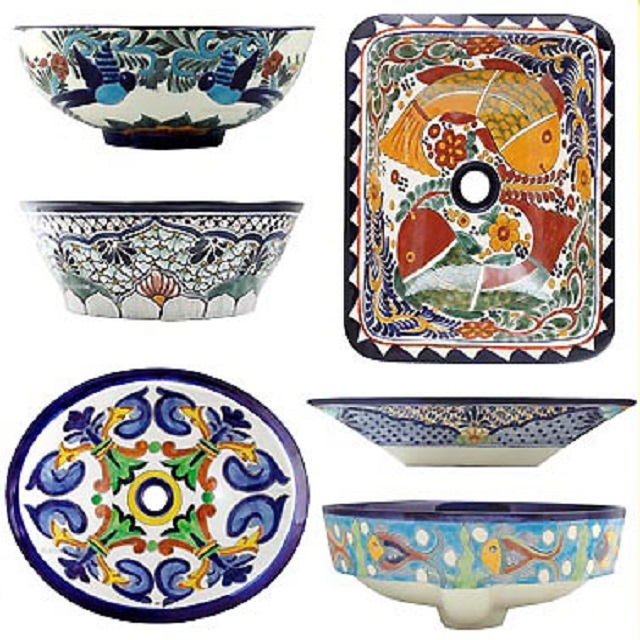 They are handcrafted out of talavera in many styles and shapes. Until now the most popular products from Mexico were oval for undermount drop-in counter installation. The latest trend however in rustic home improvement category are round and rectangular vessel sinks. They are hand painted outside and inside. There are different designs available. Among them wall mount with a decorative sink pedestal. Usually, Mexican sinks are installed in spaces with traditional country, Southern and Southeastern character. Above Counter Bath Sink "Blue Flowers"
Above Counter Bath Sink "Cobalt Peacock"
Above Counter Bath Sink "Fish and Flowers"
Above Counter Bath Sink "Flower"
Above Counter Bath Sink "Green Cloud"
Above Counter Bath Sink "Green Peacock"
Above Counter Bath Sink "Guadalajara"
Above Counter Bath Sink "Hacienda"
Above Counter Bath Sink "Sea Fish"
Above Counter Bath Sink "Sevilla"
Above Counter Bath Sink "Southern"
Above Counter Bath Sink "Terracotta Flower"
Above Counter Bath Sink "Terracotta Peacock"
Above Counter Bath Sink "Yellow Flowers"
Artisan Made Wall Mount Sink "Oaxaca"
Artistic Wall Mount Sink "Baja California"
Artistic Wall Mount Sink "Chiapas"
Bathroom Wall Mount Sink "Sinaloa"
Decorative Wall Mount Sink "Coahuila"
Decorative Wall Mount Sink "Veracruz"
Hand Crafted Wall Mount Sink "Guanajuato"
Hand Crafted Wall Mount Sink "Quintana Roo"
Hand Decorated Wall Mount Sink "Jalisco"
Hand Decorated Wall Mount Sink "Tlaxcala"
Hand Made Wall Mount Sink "Michoacán"
Hand Made Wall Mount Sink "Nuevo León"
Hand Painted Wall Mount Sink "Guerrero"
Hand Painted Wall Mount Sink "Morelos"
Handcraft Wall Mount Sink "Tamaulipas"
Handcrafted Wall Mount Sink "Chihuahua"
Handcrafted Wall Mount Sink "Zacatecas"
Handmade Wall Mount Sink "Campeche"